In 2004, the Australian wool industry agreed to phase out the practice of mulesing. The Department of Primary Industries and Regional Development (DPIRD) remains committed to this agreement and has been involved in a variety of research projects to help producers manage non mulesed sheep. Research has shown that it is possible to successfully manage non mulesed sheep with little extra time or cost. Research is continuing by DPIRD, the Australian Wool Innovation Ltd (AWI) and many other institutions and producers to determine the most appropriate and effective strategies to minimise breech strike in non mulesed Merinos. DPIRD recognises that this is a serious issue and ceased mulesing on its own flocks in 2008 in order to carry out research into managing non mulesed sheep. This ensures that sheep producers have access to the best information and practical recommendations for managing flystrike in non mulesed sheep. View more information on managing flystrike (body and breech). DPIRD recommends that producers who continue to mules use a registered pain relief treatment (for example Tri-Solfen) at mulesing and that the mulesing is done by an accredited operator. Producers who mules when conditions are ideal for flies should use a preventative chemical. All contractors in Western Australia (WA) should be accredited and all producers who mules on their own property should also be accredited. Producers should contact the Kondinin Group for training information. Producers who have ceased mulesing or have wool from mobs of non mulesed sheep are encouraged to complete the National Wool Declaration (NWD) as part of marketing their wool. Please visit the Australian Wool Exchange (AWEX) for more information. This voluntary declaration is completed and signed by the owner/manager and it can be used immediately. This information is available to buyers and is expected to lead to a price differential as buyers compete to fill orders from discerning customers. The mules operation, or mulesing, was developed by JHW Mules in 1929 to aid in the control of blowfly strike in the breech or crutch of sheep. It is a surgical procedure performed on lambs at marking time where the skin folds around the breech area are removed by mulesing shears or a knife. 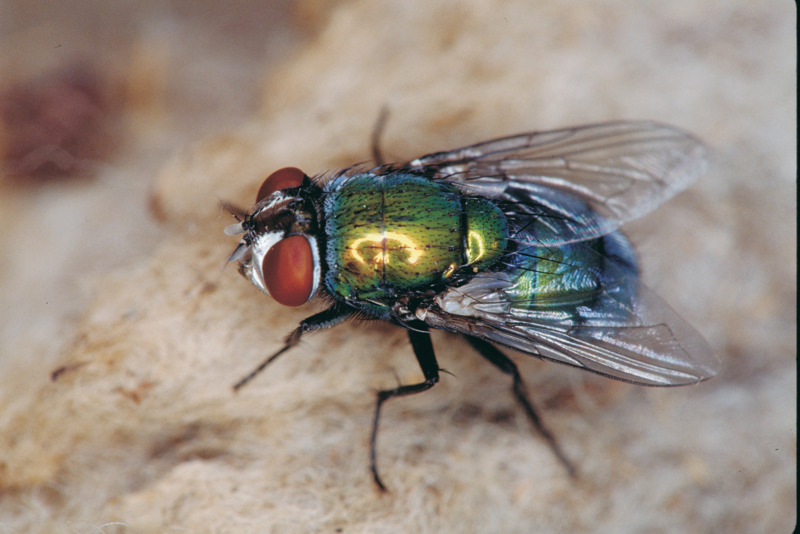 Blowfly strike is when blowfly larvae develop on living sheep. The maggots feed directly on the skin of the sheep, causing considerable distress and, if untreated, may lead to its death within a few days. Mulesing is currently performed on approximately 70% of Merino wool-producing sheep in Australia. It is highly effective at reducing the incidence of breech strike however social attitudes to animal welfare have changed dramatically in the past 20 years and in November 2004 Australian wool and sheep industry leaders unanimously expressed their commitment to the phasing out of mulesing. Genetic selection for flystrike resistant sheep is not a new idea and a large amount of work was completed in the 1930s, 1940s and 1950s on genetic selection for resistance to breech strike. However, with the advent of mulesing, most efforts then focused on non-genetic methods such as the use of chemicals and crutching. A breeding program by DPIRD at its Katanning Research Facility and the Commonwealth Scientific and Industrial Research Organisation's (CSIRO) Livestock Industries at Armidale, New South Wales, with support from AWI, is currently being carried out to determine whether sheep can be bred for breech strike resistance, and if so, which indicator traits will be the most effective to select indirectly for resistance. This experiment will also indicate how long it takes and what the trade-offs may exist with other commercial traits such as fleece weight. For current results and recommendations please read the Breech Strike Resistance newsletter available as an attachment to this webpage. Read further general information on managing flystrike. Research has shown that selection of breeding animals that have low dag score, breech and body wrinkle will have immediate and long term effects on the incidence of flystrike in the breeding flock. These animals themselves will have a lower risk of flystrike and so will their progeny. Research is continuing to find additional indicator traits to select indirectly for resistance to flystrike. However, the results to date have shown clearly that selecting on these traits will increase your flock's genetic ability to resist breech strike. Recording breech wrinkle score is best done after crutching or shearing or at marking of animals. Wrinkle scoring lambs at marking is a great way to reduce your flock wrinkle score as it is a repeatable trait. Consider culling all wrinkle score 4 and 5 animals. Breech wrinkle is related to body wrinkle and neck wrinkle score. This means that reducing breech wrinkle score will also reduce body wrinkle and hence susceptibility to body strike is reduced. Reducing the overall wrinkle score of your flock will also have added benefit. Past research has confirmed that the number of lambs weaned per ewe joined decreases as the breech wrinkle score of the ewe increases. Selecting against wrinkle score does not necessarily mean you will decrease your fleece weight. Analysis of sires across Australia has shown there are individuals within a mob with low breech wrinkle scores and higher than average fleece weights. Sheep in the top left quadrant of the below graph have both high greasy fleece weights and low wrinkle score, so it is possible to have both. The best time to assess dag score in a winter rainfall region is in the spring time prior to hogget shearing when at least 20% of the flock have an average score of 2 to 3 (see picture below). Consider culling all score 5 sheep prior to mating. Mark score 4 and score 3 ewes and note the number in the flock so that an assessment of how many of these could be culled from the breeding flock can be made. Read specific information on breeding sheep for worm resistance. Bareness can be scored by using the breech cover scoring system to score sheep prior to hogget shearing. Culling score 5 animals will also have a beneficial effect on reproduction rate as shown in the following graph. Ewes with low breech cover scores wean more lambs than ewes with high breech cover scores. The number of animals that are culled is determined by the selection pressure that you are prepared to put on the flock. Higher lambing rates allow greater selection pressure due to more sheep available to choose replacements from. All sheep with a score 5 in any of the indicator traits should be culled. The relative importance of each of these traits is still being assessed and research is underway to assess the heritability and if there are links between traits. Some flocks will have higher incidence of some traits compared to others. Wool colour is also important for body strike and some producers have identified animals with large bare areas around the breech and are investigating the heritability of these traits. Urine stain is also a key attractor for flies. Consider culling all ewe lambs with score 5 for urine stain. It is possible to identify high urine stain lambs on the marking cradle. These should be culled upon weaning. Only a relative few ewes will have urine stain problems. Identify them prior to crutching and consider culling high scoring animals. In general, the greater the selection pressure and heritability of the trait, the faster the genetic progress. Current research is continuing to find other indicator traits that could be used to select directly for flystrike resistance. However, the results to date have shown clearly that selecting on the known indicator traits will increase your flock's genetic ability to resist breech strike. South-west Victorian ultrafine Merino producers David and Susan Rowbottom have almost 40 years of experience of managing Merinos without mulesing. While the remaining mulesed sheep did not get flystruck, the non mulesed sheep became a massive problem that David tried to control with one or two extra crutchings a year and as-needed treatment of flyblown sheep in the paddock. However the solution to the fly problem would come indirectly through David’s breeding decisions to improve the quality of the flock’s wool in this region of 800 millimetre (mm) annual rainfall. At the first shearing, the flock had produced three lines of wool. David’s eye was caught by one bale of very white, long-stapled, high-yielding 20.4 micron wool which was grown by the plainer ewes in the flock. “With this wool in mind I selected rams with very white wool, long in the staple with as fine a micron as possible, which in those days was 16-17 micron; this wool was only produced on plainer-type rams. “We embarked on a heavy culling program, culling the very wrinkly sheep with off-coloured wool first, and culling the short-stapled white-woolled sheep when numbers permitted. We built up numbers by keeping the top ewes for as long as possible, even up to 14 years of age.” The Victorian Stud Merino Sheepbreeders Association approved the Rowensville Merino flock for stud registration in 1995. Years of continued selection for long-stapled, very white wool on plain-bodied sheep achieved an unplanned for but very desirable effect: a major reduction in flystrike. “As the wrinkle was reduced, flystrike notably diminished and today is very minimal, even when the district is awash with a fly wave. The fibre diameter has since dropped to an average of 14 micron. The Rowbottoms’ success in the Zegna Vellus Aureum international fleece competition is testament to the successful improvement of their wool with four first places, three seconds and a third in six years. Along with selections for the right skin and wool type, they have found that other management practices are also important. “Exceptional wool quality is only produced on very good-doing sheep that remain healthy and clean, thus they do not attract flies like poorer doers. Selection and culling must reflect this. “The timing of drenching to take place prior to seasonal conditions that are most conducive for increased worm burdens is also important, as is of course the rotation of drench groups to prevent drench resistance. The combination of wool and skin type on a good-doing sheep, along with good management practices, has resulted in flystrike on their farm being a thing of the past. Their non mulesed sheep also very rarely get flystruck. Apart from ram’s heads, they do not use chemicals for the prevention of flystrike. David’s view is that the cessation of mulesing is critical to guaranteeing the long-term viability of the industry. Michael and Helen Palmer of Jerdacuttup, WA, made the decision in 2008 to cease mulesing. They run a 1250 hectare mixed cropping and livestock property, located approximately 10 kilometres from WA's south coast. The 800 head self replacing ewe flock is the product of 20 years selective breeding in an environment conducive to flystrike. All lambs, except ewe lambs that are retained for breeding, are fed and sold as prime lamb at 11-12 months of age. The flock is plain bodied and has a very low incidence of body strike with less that 1% requiring treatment. Prior to ceasing mulesing, breech strike was managed with mulesing, crutching, worm management and tactical chemical treatment with Vetrazin. The decision to cease mulesing was primarily based on the 2010 phase out of mulesing and the view that it would be better to evolve a flystrike management system that did not involve mulesing, so that the welfare of their sheep and the profitability of their sheep enterprise could not be harmed by any controversy surrounding the issue. Michael and Helen have managed the transition by carefully planning and integrating available management tools, such as timing of shearing/crutching, worm management, preventative chemical treatment and selective breeding in order to minimise breech flystrike. They have found that staying on top of worms by having a sound worm management plan is crucial for minimising dag accumulation. A dag score 4 animal can be up to seven times more susceptible to breech strike than a dag score 1 animal in the same mob. They also use a preventative breech chemical treatment of Clik on all sheep post shearing in September and post crutching in March. If needed, dags are now also controlled by a second crutching in August. They select on dags when selecting hogget rams and ewes for breeding, by culling the ones with dag scores 4 and 5. Michael and Helen are now achieving a breech flystrike rate equivalent to their previous mulesed flock management system, at an estimated additional cost of $4 per adult sheep per annum. Now that they have established this baseline, they are keen to incrementally lower their breech flystrike rate and associated management costs through continued selective breeding and fine tuning their management system. There is probably not a Merino farmer in Australia who does not believe that the adoption of mulesing during the 20th century was the kindest thing we could have done for our sheep in our climate. It is also true there would be few mulesing farmers who do not find the whole process distasteful. The debate, however, is not driven by beliefs and preferences, likes and dislikes, but by commercial realities. Of course it is prudent business practice to count the additional costs associated with ceasing mulesing, but the fact remains that we lose sight of what the customer wants at our peril. At Eildon Springs, we come from the fine wool end of the market and what I have to say must be read in that context. Our own wool, and that of the flocks serviced by our rams, is destined for high end fabrics. Those fabrics, no matter where they are created, are made to European specification. This is obvious for fabric intended for European fashion houses but, just as importantly, Chinese and Indian fashion houses increasingly imitate European demands in response to the requirements of their own local market. These two, the most populous nations on earth, are developing very rapidly that market most important of all; an affluent middle class increasingly seeking European fashion as the international hallmark of luxury. This is all, of course, a vast oversimplification but it was the starting point for our thinking at Eildon Springs about the issue of mulesing. Our customers — ultimately those in line with European demands — do not want us to mules. So we decided in 2008 that we would cease that practice. A few years down the track, we established there were essentially three headings of concern to address as we approached the issue of ceasing mulesing: genetics, location and management. The first — and I would argue the most important — issue to consider is the genetic makeup of one’s sheep. It is well established from both research and every day observation that heavily wrinkled sheep are much more likely to be struck, if for no other reason than the retention of skin moisture within the wrinkles. At Eildon Springs, we were well-served in this area because our breeding flock had been derived from Stockton genetics. Allan Stewart of Stockton has spent decades successfully breeding out wrinkles and refining his genetics for the production of well-nourished, well-crimped and beautifully soft white wool. This was the starting point for us at Eildon Springs nearly a decade ago. To maintain these characteristics, we culled and continue to cull from our stud breeding ewe flock any which do not make score 2 for wrinkles. This may sound severe but it gives us confidence that we are producing rams for our clients which in turn will help reduce over time the wrinkle score for their sheep. Similarly, we have worked hard to maintain the famous Stockton style, of which colour is an important issue when it comes to avoiding strike. White, well-nourished wool is the order of the day. Another genetic factor we considered was that of worm resistance. If we can move our flock in the direction of less frequent and less severe scouring, we produce less breeding ground for the strike blowfly. We take dag scores at crutching and this enables us to cull out those ewes showing greater susceptibility to scouring and, over time, produce a flock more resistant to worms. Thus, as we approached the issue of ceasing mulesing, we examined our genetics and decided we were already producing sheep that were relatively wrinkle-free and had white, well-nourished wool and that we were making progress with worm resistance. We considered whether our wool was right for our area. We had early been persuaded, as was Allan Stewart before us, by some of the early work of Dr Jim Watts. Consequently, our animals have soft and pliable skins and follicle alignment that promotes very long staple growth. It is through extra staple length that our wools gain bulk. Nevertheless, we chose not to pursue the SRS® style to the very broad-crimping styles recently so popular. We have positioned our wool somewhere between the broad-crimping SRS® styles and traditional superfines. There is a photograph of our wool style on the Eildon Springs website. Our average ewe flock fibre diameter is 17 micron (μ) and we plan over time to move the average to 16.5μ. Our stud is at Waubra, just outside Ballarat in central Victoria, at the north-east extremity of Victoria’s Western District. Daytime temperatures typically vary from below 10 degrees in winter (with several overnight hard frosts a year) up to 40 plus degrees in summer. The long term average rainfall is 650 millimetres (mm) and typically comes in winter and spring. Having said that I should say that we are testing our wools very differently this year when I look out the window now in February and see green paddocks and some remaining large puddles! We have had about 400mm of rain in the last three weeks. It is interesting to record that at our on-property sale in November we gained new clients who were seeking to reduce their crimp size and change their style of wool more in line with ours in what they told me was a response to the additional rain. If we were further north and much drier than we are, then possibly another wool style would work but we find that what we have been producing suits us and our typically more southern clients. This remark, however, has to be understood in relation to Victorian climate and geography. What is important is ensuring that sheep conformation and wool style are appropriate for their location. With the best will in the world, ceasing mulesing will allow more flystrike to occur unless specific management techniques are employed. As Bell and Sackett say, “It is apparent from [various] studies that breeding for plain bodied sheep is unlikely to confer the same protection against breech strike as does mulesing.” Breeding to reduce wrinkles is an important part of the change to ceasing mulesing but it is not enough of itself. Crutching the ewes in late July, four weeks before lambing, to achieve reduced wool on the breech during spring as well as to aid lamb suckling. We will have taken faeces samples in the paddock a few days before the ewes are brought in for crutching and, if the faecal egg count (FEC) shows this is necessary, the ewes will be drenched. Lambing from the first week of September. This gives lactating ewes and, later, weaning lambs the advantage of green feed. Tail-docking two weeks after the last lamb is born. We use a hot knife and apply Dicyclanil4 to the breech of the lambs. The lambs are routinely drenched at this time. Thereafter and until winter, weaners are checked about monthly for worm count by taking fresh faeces samples from the mob in the paddock and sending off for testing. Immediately after weaning lambs at 11-12 weeks, applying Cyromazine to the ewes. It may be noted we apply Cyromazine5 rather than Dicyclanil because of the lesser cost of the former. It is effective over a shorter period than the Dicyclanil but is still effective until early February when we crutch. Crutching in early February. We also find it convenient to shear the weaners at this time, possibly drench them and then move them to fresh pasture. Shearing in the first week of March. We have to shear our rams then (or in mid August) according to breed society rules and, being a small stud, it is convenient for us to shear the whole adult flock at the same time. Shearing should provide sufficient protection for about eight weeks but, if the rainfall and temperature in late April suggest a substantial risk still exists, we might decide to apply a second dose of Cyromazine – although so far we have never done this. We also believe it is important to maintain the flock in good condition. Having pasture-sampled our paddocks throughout the year, we are aware at any time of the available nutrition. We can therefore plan minimum supplementary feeding to ensure sheep of whatever category – rams, lambs, lactating or dry ewes – have available to them the necessary feed to maintain constant condition. Having said this, however, we do allow the breeding ewes to fall off a little in condition after weaning so that we can more easily have them on a rising nutrition plan as we approach joining. Has our approach to ceasing mulesing worked? We had not had a single case of body or breech strike for about five years until January 2010 when a very wrinkly weaner had shoulder strike. I should have earlier culled him but he was apparently so good in other ways I disobeyed my own rules. A good example of why it is good to stick to one’s guns! In one particularly extraordinary spring and summer, full of rain and warm humid weather, we had a little more difficulty. Two weaners developed a breech strike in late January which we were able to detect and treat early. I suspect that the extraordinarily heavy rains had washed away the Dicyclanil which we had not replaced because we were so close to crutching – and because heavy demand had made the product difficult to obtain. Further, two of the ewes developed a shoulder strike. Investigation suggests this originated at an area where the heavy rains had penetrated the fleece and created water stain. Those two ewes were then marked for culling. We had, therefore, had more trouble that year than in the past, part of it associated with the cessation of mulesing, but we were happy that what we had chosen to do to bring us through that incredibly difficult summer had worked! I am aware of farmers in our area reporting strike in a third of the flock that season. We have always had some poll strike amongst the rams in summer, especially among the young rams as a result of fighting, but this is kept in control by regular checking and appropriate chemical application. I always suggest to clients that, as rams are especially valuable animals, they deserve special care. Besides, most properties have far fewer rams so any treatment is less demanding than it would be for the ewes. Our rams are key-hole crutched in early spring, prior to the selling season. Just prior to Christmas, they get a full crutching and complete polling: they don’t look as pretty once polled but this does protect them if blood is drawn after fighting. We then crutch and shear them along with the ewes in early February and early March. In addition, they are brought in from time to time and checked for strike, especially poll strike, and given Cyromazine as appropriate. That difficult season some years ago certainly tested our decision to cease mulesing but this it was still an extraordinary year. We remain committed to the decision. We believe that, for the commercial reasons advanced at the outset, it was the right decision and that the move has been a good one but it was important as part of that move to consider carefully the big issues: location, genetics and practice.